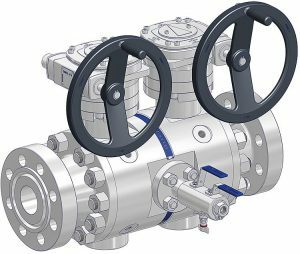 AS-Schneider Taurus Series Double Block & Bleed Pipeline Ball Valves are available with a lot of options. The Taurus Series are basically Full Bore Valves but are also available as Reduced Bore Design. Primary and Secondary Isolation Valve are, as standard, ball type valves with Floating Ball or Trunnion Ball Design, the bleed valve can be provided as integral needle type valve with screwed or flanged bonnet as well as flanged valves like ball valves, Double Block & Bleed Valves (VariAS-Blocks) or Monoflanges. Standard Flange Connections acc. to ASME B 16.5. The Taurus Series are also available as Block & Bleed Type.